A few days ago Liqurious reported a Duff Beer sighting. It appears to be the real thing. There is a video review at iFoods.tv and there is a Duff Beer website here. But alas, this beer will remain a figment of the cartoon. 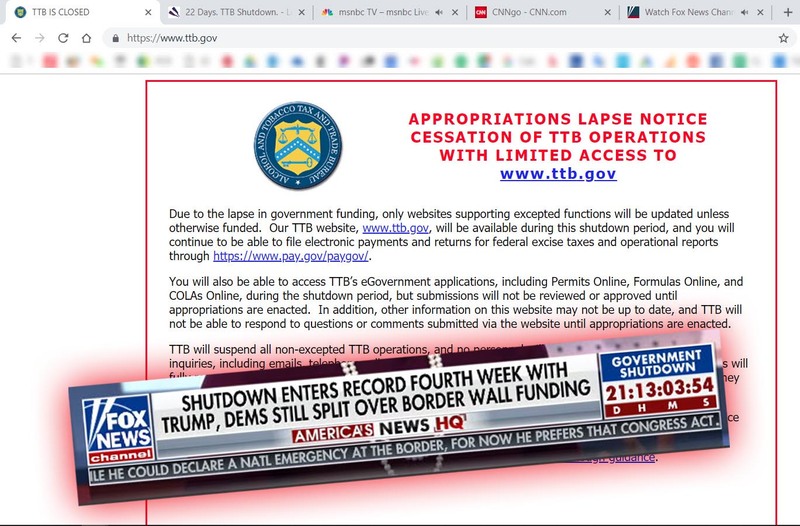 There is nothing very similar approved in the TTB database. The nearest thing is the above keg label, for the beer at Duff’s famous wing restaurant in Buffalo, New York (near and dear to Robert’s heart as it was a mile from the law school campus). 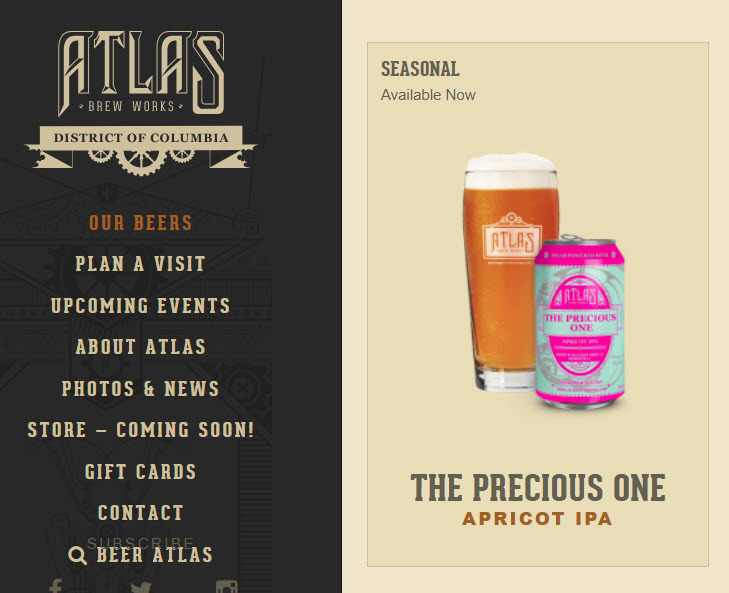 We are unlikely to see Homer Simpson’s favorite beer anytime soon, at least in the US. Matt Groening (creator of The Simpsons TV show) has stated that he will not license the Duff trademark for a real beer, over concern that it would encourage kids to drink. 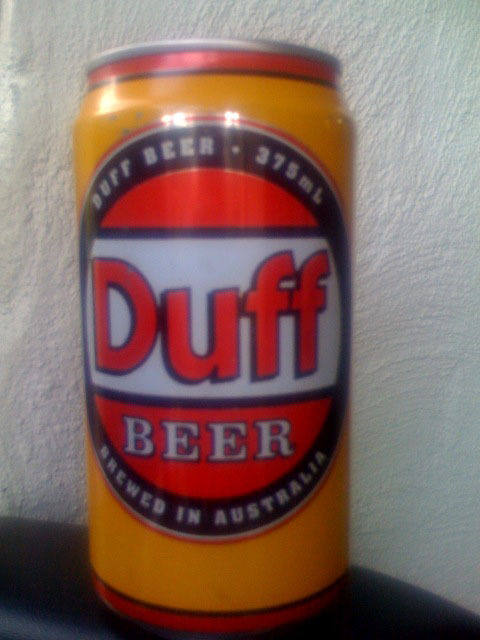 Fox TV and Groening sued an Australian producer of Duff in 1995. My conclusion is that the breweries have engaged in a course of conduct calculated to achieve and exploit a strong association between their use of the name “Duff Beer” and “The Simpsons”, which in fact is deceptive, while at the same time, hoping to avoid legal liability. In fact, their hope of avoiding legal liability were not realised in that they have breached the Act and the charge of passing off has also been made out. Although Bart and Lisa visited Duff Gardens and saw the Seven Duffs (among them, Tipsy, Queasy, Surly and Remorseful), Simpson’s creator Matt Groening makes sure that the Simpson children do not drink DUFF Beer. Homer, on the other hand, is a huge DUFF fan, winning a trip on the Duff Blimp, hanging out with Duff Man and drinking regular Duff beer (not Duff Breweries’ Duff Lite, Duff Dry, Raspberry Duff, Duff Dark, Tartar-Control Duff, Lady Duff, or Duff Gummi Beers). Non-cartoon people trying to register DUFF as a trademark for beer probably drank too many beers or had too few trademark lawyers helping them out. 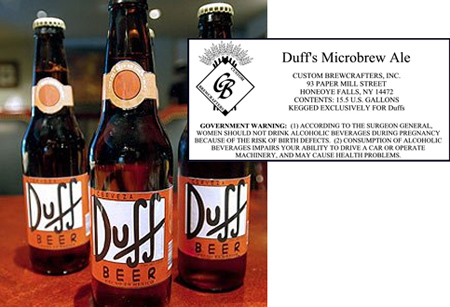 For example, an applicant named Marcus Duff from filed a U.S. trademark application for DUFF BEER for beer in 2007. 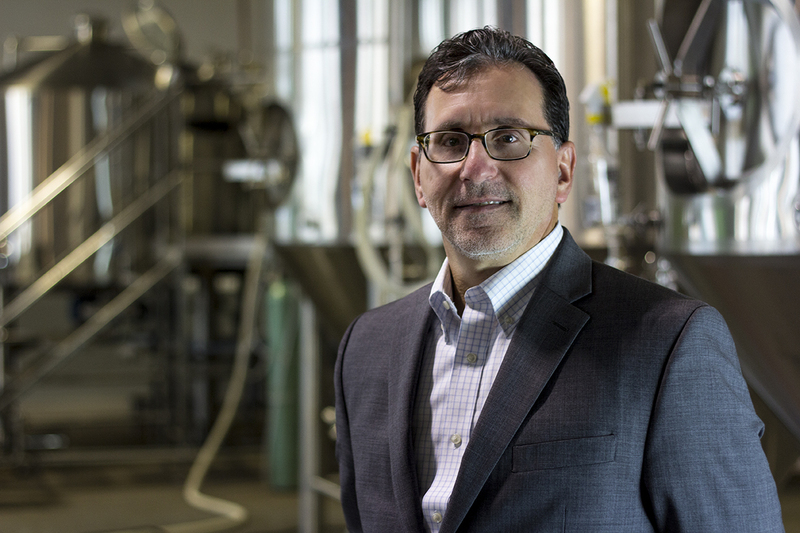 The Patent and Trademark Office (PTO) refused this application, noting it would likely cause confusion with several, already registered trademarks for DUFF’S covering bar services and food owned by WNY Restaurant Systems, Inc. 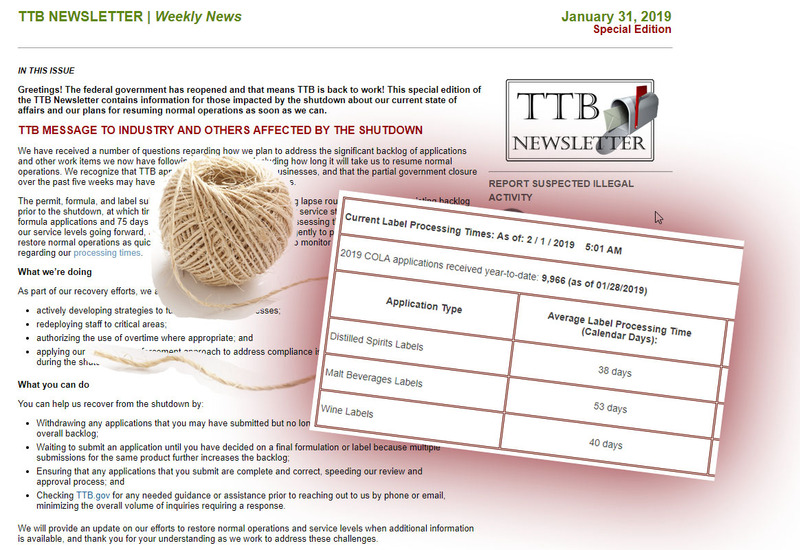 The PTO reasoned that confusion is likely because applicant’s beer is related to registrant’s bar services and that beer is served in bars. Marcus Duff was done at the PTO. Without searching PTO records to see that the PTO had given Mr. Duff a hefty bum’s rush just a year before, another applicant swaggered up to the PTO in March 2008 and plopped down their money to try to register DUFF for beer and ale. Cerveceria Mexicana S. de R.L. de C.V. filed an trademark application alleging that they were already using the mark for beer and ale. When filing an application based on use, a trademark applicant is required to submit a specimen showing the mark used with the goods. In the case of beer or wine, that means a label or a photo of a bottle with a label on it. Ignoring this requirement, Cerveceria Mexicana submitted as its specimen a plain white sheet with the word DUFF on it. The PTO not only pointed out the insufficiency of this specimen of use, but refused the application on the same basis as it had refused Marcus Duff’s application: the prior registered DUFF’S marks. So where is 20th Century Fox, the owner of the Simpson’s intellectual property, in all of this? On the stool next to Barney Gumble at Moe’s Bar, happily watching the PTO protect their DUFF mark? Probably, although we have to give Fox more credit. Fox tried to register DUFF BEER in a stylized form (like it appears on labels in the show) for several non-beer products in 1999 (shirts, hats, etc). Oddly, when it came time to prove these marks were in use on the dedicated goods, Fox could not do so and abandoned its trademark applications. The problem was probably that the marks, although open and notoriously used on the longest running television comedy show, were not actually used on these goods in the real world. A few years later, Fox began using DUFF on several non-cartoon items and reapplied for trademark registration, obtaining one registration for DUFF and soon to obtain a few others for DUFF BEER. True to Groening’s wishes, these trademarks do not cover beer, but cover items like shirts, swimwear, bathing suits, pants, hats and soft drinks. Although Groening and Fox have been loathe to water down the Simpsons with massive licensing during the first 20 years of the show, that seems to have changed in the last few years. Fox appears to have licensed a considerable volume of Simpson’s intellectual property to establish a Simpson’s Ride at Universal Studios. After the ride, you can tour a full scale version of Apu’s Kwik-E-Mart and buy all kinds of Simpson’s gear, including the DUFF energy drink, sold in a can that looks just like a DUFF Beer from the show. The perfectly recreated DUFF can prominently states that the drink is produced by Boston America Corp under license from Fox. Two lessons: 1) even cartoon trademarks can be protected; and 2) get a trademark lawyer (not the cartoon Lionel Hutz) to help you out. What about Pawtucket Patriots from Family Guy? There was a rumor in late 2007 that a Rhode Island based brewer would produce Pawtucket Patriot Ale, but we have not been able to find a COLA. It may very well remain – like Duff – a fictional brew. Those are all good points and I have to say I agree with them RE trademarking etc but how come I was able to buy Duff beer over here (and it is now appearing in many more shops)? I’m not sure if it’s an apocryphal story, but supposedly a 24-can carton of the Australian Duff sold on eBay for $10,000. I have one (unopened) can, because I knew it would quickly become a collector’s item! I will send a pic to Robert, and hopefully he can upload it to the comments page. Here is the can of James: http://bevlog.bevlaw.com/wp-content/uploads/2008/11/duff-omond.jpg. Let the bidding commence. That’s hilarious. I checked the trademarking records with the Trademark Office, and they don’t seem to have any Duff Beer trademarks pending. I suppose it would be considered trademark infringement if that happened. Oh well.